As a psychologist, I see women of all ages and backgrounds who want to improve how they feel inside and out. They say, “I just want to like myself more and feel more confident.” After 20 years of practice and thousands of patients, I tell them there are three keys to self-confidence at any age: 1) know what to expect, 2) be prepared for the unexpected and 3) make time to take good care of yourself. Take Julia, for example, a 44-year-old mother of three and an office manager at a large advertising agency. She went from looking great and feeling on top of her game, to being overwhelmed by what she called a “body rebellion.” She’d been dealing with bladder leakage since age 39, but now the symptoms were in full force. Between work and caring for her family, she had little time, or energy, to look after herself. She felt she was losing control of her life — both physically and emotionally — and with it, her self-confidence. This was terribly unsettling to Julia who, until now, had staked her identity on exactly the opposite. She came for therapy, convinced there was no one else she could talk to. Her mom — her closest confidant — had passed away a year before and she was embarrassed to share her concerns with her friends, husband, even her internist. “How can I tell anyone that I am leaking?” she asked. She liked being viewed as someone who “had it all together,” and yet felt far from that now. Julia is not alone. About one in three women experience bladder leakage of varying degrees. Not unlike the way acne outbreaks rock a teen’s self-esteem, leaks challenge even the most confident of adult women. At both stages of life, these changes lead many to feel — like Julia did — that their body turns on (or betrays) them. They feel out of control and, as a result, their confidence gets shaken. And they don’t know where to turn. Throughout life, we are faced with unexpected physical challenges. For women, this is especially true when hormonal changes happen. Often we experience these changes as a betrayal, wondering, “How can this be happening to me?” When their bladder first starts working less efficiently, say after a sneeze or a cough, they feel embarrassed or ashamed – as if it’s their fault. We know this is not the case, as bladder leakage is very common among women and is often the result of having a baby or going through menopause. Women who worry about making it to the bathroom may avoid doing some of their favorite activities, become isolated or worse, depressed. On the other hand, those women who understand what bladder leakage is and why it happens can take charge of the situation…and gain back the freedom that comes with being more confident. Which is what happened to Julia. Together we traced the start of her bladder leakage to the birth of her third child. I reassured her she was not alone and that there were steps she could take to relieve some of the symptoms. Simply sharing her concerns alleviated a good deal of her anxiety, but I also referred her to Poise.com for more information and the most up-to-date solutions, such as Poise* Impressa* Bladder Supports. Unlike a pad or liner that absorbs leaks, this over-the-counter product helps stop them before they even happen. This can help alleviate some of that anxiety – so you can enjoy life leak free and confident. Women have come such a long way over the past 50 years — now juggling both professional and family responsibilities while leading active, vital lives well into their 80s and 90s. To ensure that we don’t let natural physical changes get in our way, we need to educate ourselves about the natural, if not ideal, physical conditions ahead and take time to look after ourselves. Do that, and your new confidence will be evident in how you look and how you feel. I guarantee that! 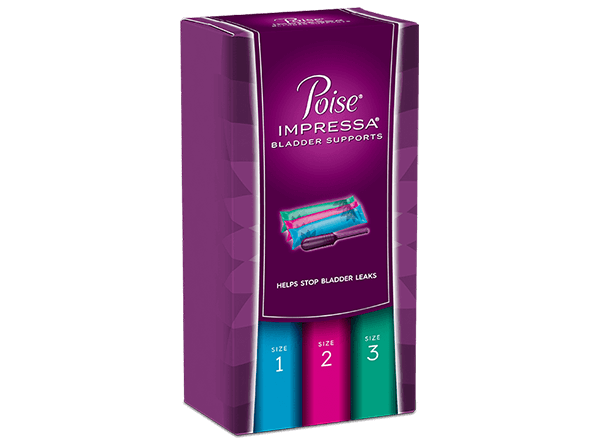 Save on Poise® Impressa® Bladder Supports with this valuable coupon.